Yesterday, lists of candidates that a conservative think tank is promoting for the climate "red team" were made public by an advocacy group. The lists were sent to EPA by the Heartland Institute, according to the environmental group Climate Investigations Center, and include names of dozens of scientists and economists skeptical of mainstream climate science whom conservatives want to be part of the effort. Pruitt has repeatedly said that he wants to put climate science through a red-team, blue-team approach, modeled after a military exercise designed to expose planning flaws. If he goes ahead with the climate red team, its roster will be critically important to how its findings are ultimately viewed. And some of the candidates on the list suggested they won't participate if others are on board. The Heartland roundup includes some scientists who have had research published in mainstream journals, but it also heavily relies on emeritus researchers, lawyers and self-funded hobbyists. Others have published books like "Science Left Behind: Feel-Good Fallacies and the Rise of the Anti-Scientific Left" or "Climate Realism: Alarmism Exposed." Joe Bastardi, who's on the list, is a meteorologist who often appears on Fox News to discuss his skeptical views and who has also made a name for himself debating climate activist Bill Nye. Others hold advanced degrees in mechanical engineering, nuclear physics or other fields not related to climatology. Some of those on the list said they were not even consulted before their names were forwarded. Also included on the lists are some scientists with a long history of peer-reviewed research, such as Judith Curry, a former professor at the School of Earth and Atmospheric Sciences at the Georgia Institute of Technology, and John Christy, a climatologist at the University of Alabama, Huntsville. Both told E&E News yesterday that they had not been contacted by EPA to work on the red team, which they would only do if they viewed it as a serious effort. "Having Heartland's name affiliated with this detracts from the potential credibility of it," Curry said. "By getting these third-rate people that are very far removed from any academic investigatory credentials is not going to help them, a lot of people who are advocates, not terribly objective people." Two lists of scientists and economists were sent to EPA earlier this year by the Heartland Institute, according to the documents obtained by the Climate Investigations Center and shared with E&E News. Personal information was redacted from the lists (Greenwire, Oct. 25). Heartland CEO Joseph Bast noted in an email recently obtained by E&E News that his conservative think tank had recently sent names of potential red-team members to EPA for feedback. Heartland has been working behind the scenes to develop a red team as some proponents of the idea have expressed skepticism that Pruitt would follow through on publicly debating climate change science. Late last month, Heartland hosted its second meeting to help acquaint potential participants with how such a debate would work within the federal government. Another meeting was slated for November (Climatewire, Oct. 16). EPA has provided little detail on how the agency intends to proceed on debating climate science. Pruitt has suggested the process could take months and would likely involve multiple federal agencies. The administrator has argued that there isn't clear evidence for how much humans affect rising global temperatures. Kert Davies, of the Climate Investigations Center, criticized the names Heartland provided to EPA. "The majority of Americans would not entrust anyone on that list with protecting public health and the environment," he told E&E News. Even though Pruitt has frequently mentioned the red-team idea in interviews, there is little public indication that he has moved on the effort at this point. Pruitt is rumored to be considering former Obama administration Energy Department official Steve Koonin to lead the exercise. Koonin told E&E in August that he'd consider it if certain conditions were met (Climatewire, Aug. 7). Heartland and EPA officials did not respond to a request for comment for this story. But a Heartland spokesman recently said that EPA reached out for a list of climate researchers. The lists apparently sent by Heartland also include some editorial comments of the candidates mentioned. One physicist is described as "quite elderly." Another is highlighted for authoring a book cited by the coal company Peabody Energy Corp. in print ads. The Heartland lists also tout those who signed a letter accusing NOAA of violating government data standards after federal researchers found that there had been no pause in global temperatures in recent years. Richard Tol, an economist, is described as "a lukewarmer, supports a small carbon tax, and isn't afraid to call out the 'left' for exaggerating the threat." Some of those named have been funded by energy companies with a direct interest in weakening science that finds carbon emissions are warming the world at an unprecedented pace. A number of the remaining researchers are self-funded and worked in other fields before making a name for themselves by rejecting mainstream climate science. Pruitt has repeatedly called for a public debate of climate science to highlight uncertainties, as has Energy Secretary Rick Perry. This week, Pruitt told Bloomberg that he was still working on the red-team exercise and likened it to "peer review happening in real time." Some conservatives say they'll only support an EPA-led red team if it is truly a rigorous examination of the science that doesn't begin with preconceived notions — like claims that the Earth is not warming. A good-faith, red-team effort could move the climate debate to a better place and elevate the status of climate science with conservatives who generally look to avoid the topic, said Joseph Majkut, climate science director at the libertarian Niskanen Center. He said he believes EPA will eventually move forward with a red-team effort, simply because Pruitt has mentioned it so often, but that it will achieve nothing if it's not run by "honest brokers and valuable contributors." He said he was disappointed with the Heartland lists, because so many of the people on them are not competitive in scientific literature. A real effort would include the National Academy of Sciences and would follow ground rules set by Pruitt as well as the scientific community, Majkut said. "You need to have a group of people who can credibly say to the scientific community, 'Here are hypotheses we think you have under-investigated, and now we're going to go and investigate them,' and when they come back with results the scientific community needs to be like, 'OK, this is at least a credible effort.'" If it's just researchers pushing the notion that more CO2 is good for the planet and other talking points debunked by the scientific community, he said, the red team will quickly become irrelevant. "Otherwise it accomplishes nothing, it will just be splashy, it will be a temporary victory because the people in power now probably hold a lot of those same views and eventually it will wash away," he said. 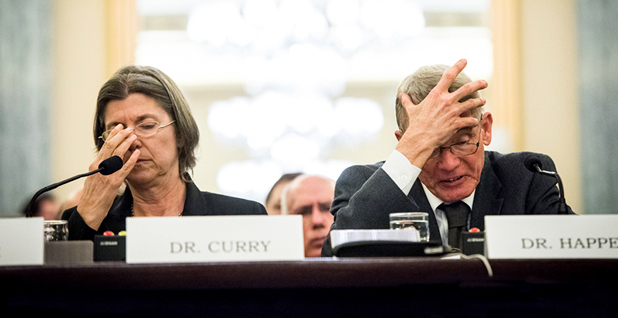 "It's a castle in the sand, it's not going to affect the scientific enterprise at all." Christy, of the University of Alabama, Huntsville, who has years' worth of published peer-reviewed research, said he has also not been contacted by EPA, even though he first proposed the notion of a climate red team more than a decade ago. He said he would not want to reject input from a wide variety of sources but said anyone working on the red team needs to have a serious scientific background. "Having an opinion is probably not strong enough to be on a red team because this stuff has to be able to stand up to cross-examination and the real scientific process, and those who have had experience with the scientific process and data set building would be the ones I would look to," he said.